Established in 2013, D Meadows Tree Surgery comprises a team of skilled tree surgeons with more than 20 years of industry experience. Our company completes jobs for both individuals and building firms, with the majority of our work being carried out by our owner, Daniel Meadows, and his specialist team. On smaller jobs, we take pride in offering a truly bespoke, personal service that is delivered by our tree surgeons. For large-scale jobs, however, when a bigger group is required, we acquire help from reputable subcontractors. 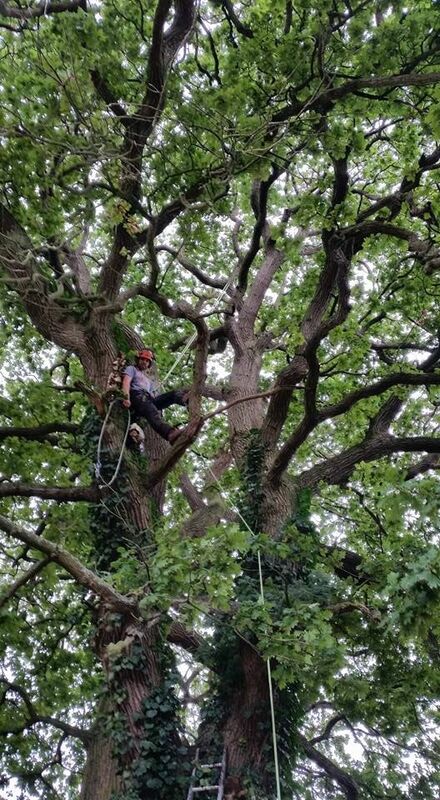 Thanks to our various skills and extensive knowledge, we cover every aspect of tree surgery. However, we have experience in working on large, crane removal jobs in Jersey, and specialise in tree felling, woodland clearance and management, canopy reductions, and the dismantling or large, hazardous trees in small spaces. Contact our tree surgeons now, in Bungay, Suffolk, to appoint our specialist tree surgery services. At D Meadows Tree Surgery, we take great pride in maintaining outstanding customer service. Our professional, friendly, and approachable staff are always available to help, and we enjoy building a rapport with each and every customer. This approach has led to us preserving a high level of customer satisfaction and receiving a wealth of work from recommendations and referrals. Many people ask us why we have a ginkgo leaf incorporated in our logo. We believe that this part of our logo symbolises a prehistoric tree and, for us, it represents our vast experience and in-depth understanding of the job.